Identical twins Kermit the Frog (Jim Henson) and Fozzie Bear (Frank Oz) join the staff of the Daily Chronicle newspaper. 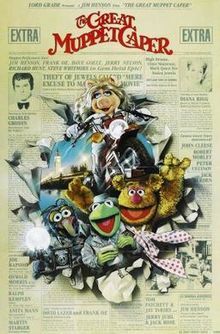 When they immediately lose their jobs for failing to report on the theft of fashion designer Lady Holiday’s (Diana Rigg) jewelry, Kermit, Fozzie and photographer Gonzo (Dave Goelz) travel to London on a quest to identify and catch the thieves. Generally speaking, we under-rate the first two Muppet movies. They are certainly fondly remembered – and rightfully so – but somehow in that nostalgic glow we can forget just how good they really are. James Frawley’s The Muppet Movie was a wonderfully inventive combination of live-action and puppetry, packed with self-referential humour and celebrity cameos. With the 1981 sequel The Great Muppet Caper – which marked Muppet creator Jim Henson’s feature directorial debut – the technique and the sophistication is kicked up a notch. This is a genuinely impressive movie comedy. A core element of the film’s appeal is its structure. It is not simply a case of puppeteers playing fictional characters. It presents puppeteers playing fictional characters playing yet more fictional characters. The Kermit and Fozzie who are identical twin brothers and aspiring journalists are getting played by the Kermit and Fozzie who both featured in The Muppet Show, and as the film progresses there is an occasional tendency to break the first reality to expose the second. Barring a brief moment towards the end of The Muppets Take Manhattan (1984), there really isn’t another Muppet production that embraces this hilarious nested structure so thoroughly. At the same time the film is constantly aware of its own artificiality. In one key sequence, Lady Holiday explains at length the back story and motivations of her no-good brother Nicky (Charles Grodin). Miss Piggy (Frank Oz) interrupts: ‘Excuse me – why are you telling me this?’ Holiday’s reply: ‘It’s plot exposion, it has to go somewhere.’ In another a random salesman (Peter Falk) talks to Kermit on a park bench until he’s asked to leave because he is interrupting a film shoot. On the other side, Henson pushes a remarkable degree of earnest realism. It was key to his genius with the Muppets: openly admitting to his audience that they are a bunch of glove puppets in one scene, and then having them all ride bicycles in the next. When it comes to Nicky’s attempt to romance Piggy, Charles Grodin plays the role completely straight – albeit exaggerated for effect. The film is deftly balanced between suspending disbelief and shattering it into pieces, and much of the humour lies in that space in between the two. The film runs a nice line in classical Hollywood as well. There are song and dance numbers, an Esther Williams-style swimming routine, and lashings of screwball comedy banter. Some of the numbers are so authentically played that they one could swap out Kermit for Fred Astaire without changing a word – ‘Stepping Out With a Star’ is one musical highlight). On top of everything else, the film is simply laugh-out-loud funny. There are jokes to appeal to kids, and jokes to appeal to adults without ever confusing the kids. We can easily dismiss The Great Muppet Caper as a charming but dated family movie from the early 1980s, but that would be a mistake: this film is genuinely clever stuff.